Lakeland, Florida — Around 7:00 p.m. on Wednesday, May 21, 2014, Polk County Sheriff’s Office deputies arrested 25-year-old Rhonda Branch, and her boyfriend, 26-year-old Antonio Allen, both of 2103 Reynolds Road in Lakeland, when their neighbors called PCSO to report a three-year-old toddler was locked out of the residence for over an hour, and was outside crying. “Rhonda Branch is certainly no ‘Woman Of The Year’ candidate – she and her boyfriend sat in their house, smoked pot and inhaled nitrous oxide, and completely neglected a helpless 3-year-old baby boy for whom they were responsible. They are the perfect example of why using illegal drugs is harmful, and should continue to be illegal,” said Sheriff Grady Judd. According to the arrest affidavits, the young child was very upset, crying, and banging on the doors and windows of the home trying to get someone to let him inside. Neighbors said it appeared the child had been locked out of the house for quite some time. The neighbors called PCSO and cared for the small child until deputies arrived. When deputies arrived, they banged on the doors and windows for approximately 10-15 minutes before getting a response. When Rhonda Branch and Antonio Allen finally opened the door, a cloud of smoke billowed out that smelled like marijuana. 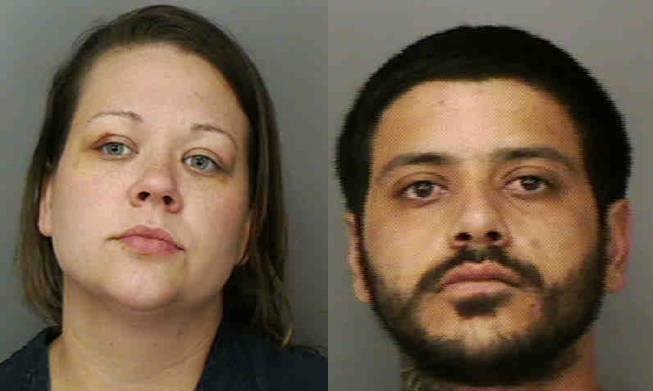 The pair admitted to smoking marijuana and ingesting “whip it” (whipped cream nitrous oxide canisters). Marijuana, drug paraphernalia, and the nitrous oxide canisters were easily located in the house. Branch and Allen admitted to using the drugs “all morning” and then going into their bedroom to take a nap, and that neither were supervising the small child. They told deputies that “marijuana should be legal anyways” and that is why they smoke it all the time. Neither of the adults were aware that the toddler was locked outside. Branch admitted he has gotten out of the house twice before in the past two weeks. The home is located on a busy road. Allen was so intoxicated that while speaking with the deputy he fell over and hit his head on the ground. Branch had two black eyes. She stated that she had recently done a “whip it,” passed out and smacked her head on something. Branch has no prior arrests in Polk County. Allen has been in the Polk County Jail on four prior occasions, for Armed Trafficking, Possession of Marijuana, Carrying a Concealed Firearm, Aggravated Domestic Battery on a Pregnant Victim, and VOP. In 2008 he was sentenced to 5 years in state prison for the Trafficking and Weapons charges. He was released in August 2013.